2018 was off to a rough start for me. Honestly, January is always one of the most difficult months for me, my depression always seems to take more energy to manage this time of year and I’m usually distracted and out of my routine during the holidays. I had a really rough day last week and it made me completely regroup and go HARD on my self-care. It’s easy to get down on yourself when you feel like you’re taking a step backward on your mental health journey but the truth is it happens to everyone and it’s part of the process. I get discouraged really easily and my first reaction to having a step back is to give up. I have to remind myself that it’s OK to have bad days and choose to give myself a break. I’ve used this time off as motivation to start really sticking to my routine. Here are some of the things I am doing that you can do when you feel sad for no reason. 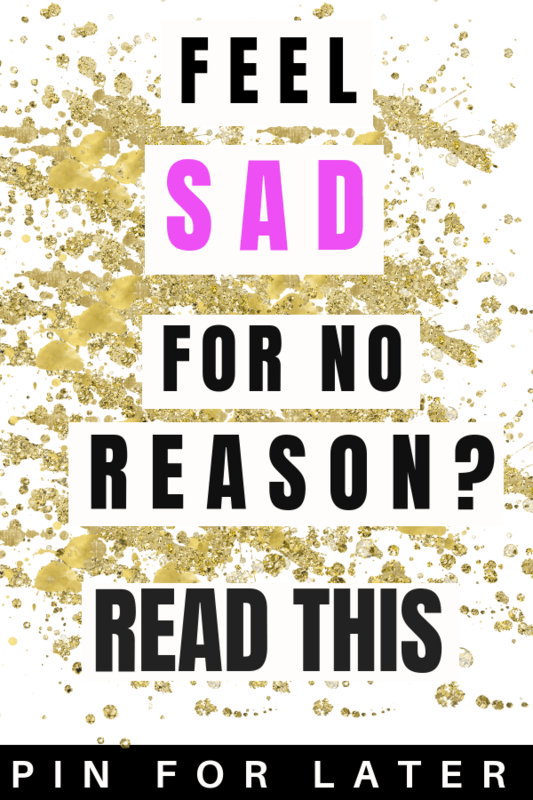 There are many things that could be causing you to feel sad. If you’re feeling sad for no reason there probably is a cause that you’re not aware of yet. It’s worth trying to identify where the feelings of sadness are coming from. Try to figure out if there is any patterns of when the sadness shows up. What were you doing the last time you felt this way? Is there an external or internal cause? It’s OK to feel sad sometimes and it’s important to allow yourself to feel your emotions without judgment. When you beat yourself up or feel guilty for feeling sad you’re probably just prolonging your own healing process. It’s OK to have off days where you don’t feel like doing anything. Your sadness could be a warning sign that you need to slow down and take a break. Give yourself a day to just feel sad and don’t judge yourself for it. You’re a human and we all feel sad sometimes. It’s important to identify if you’re sad or if you’re depressed. Sadness will usually pass but depression can require treatment from a professional. If you’re feeling low for two weeks or more you could have depression and you should talk to a therapist or doctor. I got completely out of my routine over the holidays and started sleeping in a lot. This felt great at first but I started waking up in the middle of the night and couldn’t fall back asleep. I find that getting up at the same time every morning helps me fall asleep faster. Being on a regular sleep schedule helps me sleep all the way through the night and I feel like the sleep I get is much higher quality. After just a few days of getting up at the same time, I noticed a big difference in how I felt during the day. My first extinct when the alarm goes off is to turn off the alarm and go back to sleep. Even if I do wake up a lot of days I’ll write on my laptop in bed until noon. I feel better overall if I get up in the morning and go work at my kitchen table. Even though I love working from my bed not getting up in the morning is just not great for my mental health and makes my depression more difficult to manage. Getting up in the morning helps me get the day off to a positive start and makes everything else go smoother. I’ve never been into making my bed, I’ve always felt like it was a big fat waste of time. I’ve been trying to be more mindful of how having a cluttered and messy bedroom makes me feel and to try and make it a relaxing and nice space to be in. I’m still not great at keeping my room clean (it’s currently messy AF) but I find if I just at least make the bed it makes a big difference. Eating healthy is one of the best things I can do for my mental health but the holiday season really induced havoc on my diet. I was more focused on spending time with my family and friends and eating healthy food just went out the window. I did a regroup and got rid of all the junk food I had in my house and went and got all my favorite healthy foods. I am going to try and set up a specific day each week to shop and cook food for the week. If I don’t have food already made I will eat junk food or just not eat so having healthy meals cooked is really important for me. This is a pretty obvious one but in the winter I tend to skip drinking water. This is such a basic and easy way to take care of yourself. Even if you’re having a freaking rough time and not getting out of bed much (I’ve totally been there) you can still drink water. That way you are doing something to take care of yourself and you can even set a goal for the day and see how much water you can drink. Honestly, I reached a point last week where I was just so sick of feeling like crap. Anytime I start to get depressed I try to react to it right away to keep it from getting worse. Working out makes the biggest difference in my mental health in the shortest amount of time so I go hard on it even though I totally hate it (at first). Once I get into a gym routine it’s easy to go every day and I don’t want to skip but it’s really hard to get to that place. I get so sick and tired of feeling depressed that I use that to motivate me to get through that first week. Most TV shows really make me feel like garbage. I can’t watch any violence on TV at all so that already eliminates a ton of TV shows. I also try to stay away from the news or dramas that are going to bring my mood down. I am focusing on surrounding myself with media that makes me feel good and cutting out everything that makes me feel crappy. Lately, instead of watching TV I just read self-help books and it makes me feel way better. I don’t really journal about my day but every night I write a gratitude list and a bunch of affirmations in my journal. I think it helps to take some time at the end of the day to put things in perspective and just be freaking glad for the blessings in my life. It’s easy to let depression just make you feel like you’re whole life is a big drag but there really are so many things to be glad for. I have free journal prompts and affirmations you can download if you’re interested in starting a journaling practice. This is something I really struggle with. When my functioning is low I beat myself up and feel guilty for not getting as much done as I “should”. It’s important to remember that just because you are having a low functioning time doesn’t mean that you’re not making progress on your mental health journey. Often, when we are processing past experiences or about to step into a higher version of ourselves our functioning will drop because we are using a lot of energy to heal and process. It’s important to remember that low functioning isn’t inherently bad. Be realistic about where you are with your physical and mental health when giving yourself tasks to get done for the day. If you’re having a more difficult time getting tasks done keep that in mind and write out a realistic to-do list. 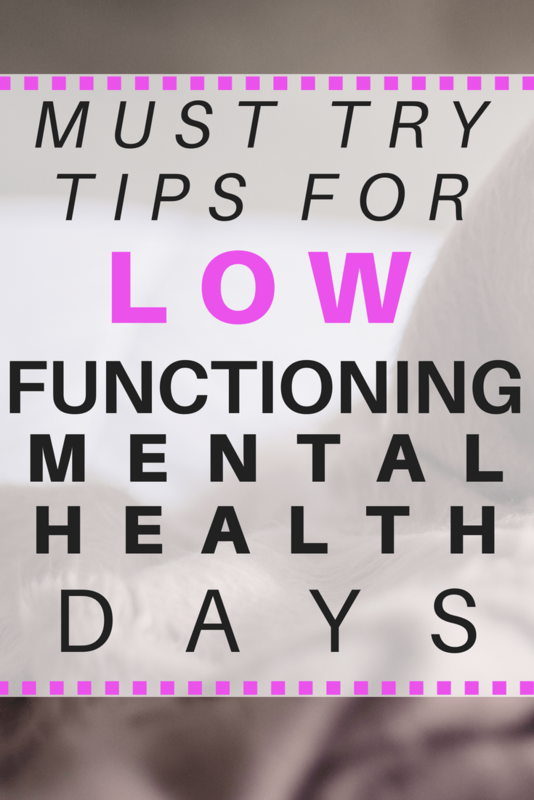 A task list for a low functioning day might include items you usually do without much thought like showering or getting out of bed. Keep a list of everything you got done for the day and update it with every task you accomplish. On low functioning days it’s important to focus on what you DO get done not on what you don’t get done. If you talk to someone on the phone, do laundry, eat breakfast or take a shower all of those things go on your celebration list. This helps you train your brain to focus on the things you are doing instead of beating yourself up over all the things you aren’t doing. If you’re functioning drops really low or if you’re having a hard time for a long period of time please reach out and get help. I have a podcast episode you can check out about asking for help when you’re struggling with mental health. I also recommend getting a therapist to help you (I talk to a therapist online via Skype with BetterHelp). It’s important to start taking steps to start getting back to the higher functioning version of yourself. These things have really made a big difference and I’m already starting to feel back to my old self. I hope your 2018 is off to a better start than mine but if it’s not, know that it’s OK and your not alone. Hopefully, this post will help you think of some things you can do to pull yourself out of depression and start feeling better. 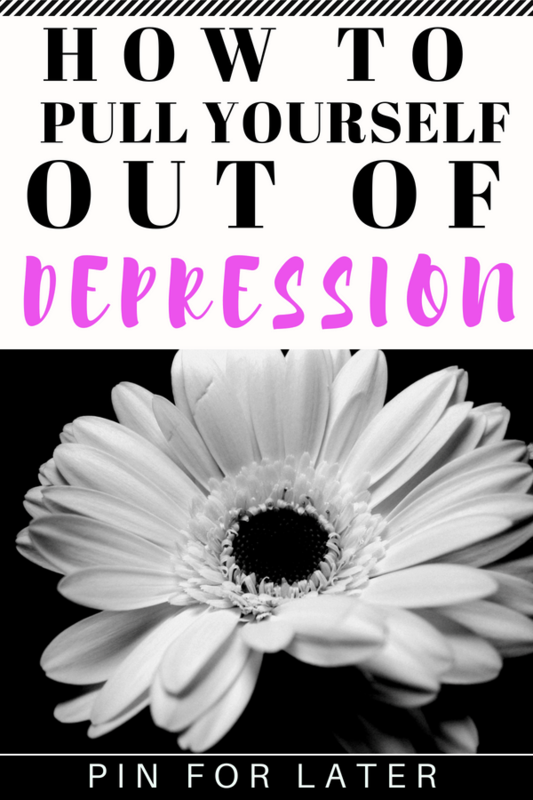 If you’re looking for more posts about depression check them out here. It’s important to balance healthy habits with doing some fun things to cheer yourself up once and awhile. I had a total crap day yesterday. I was unproductive and some exciting things I thought were going to happen fell through. When something I’m looking forward to falls through I feel sad for no reason and often find myself feeling down. 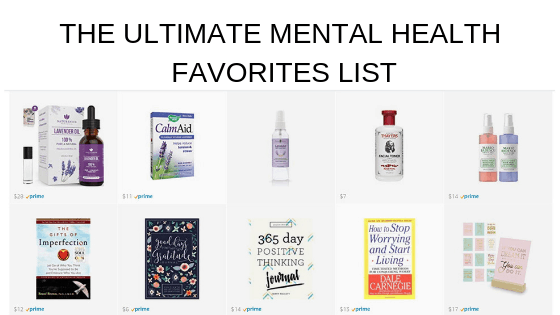 It inspired me to write up this list of self-care options for stupid no good terrible bad days. 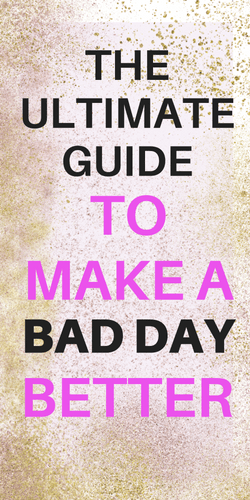 I hope it gives you some ideas of things you can try to make a bad day better. Get your positive energy up by making a vision board. I keep mine on Pinterest. Plan a trip. Even if it’s a fantasy vacation you want to take someday. Pick out where you would stay, places you would eat and what you would see if you could go anywhere in the world. Go to the Grocery store and make your favorite meal. Grilled cheese and mashed potatoes is my favorite comfort meal. Call a friend you haven’t talked to in a while. Reconnecting with someone can feel really wonderful. Write letters to all of your pals and tell them all the reasons they are so great. Watch your favorite movies. My bad day go to movies are Breakfast at Tiffany’s and Monster’s Inc. I’m also a fan of watching rom coms from the 90s. Explore your town. Check out some museums or parks. Make yourself some healthy meals for the week. Meal prep is the only way I can make myself eat healthy throughout the week. Let it all out. Watch a movie that makes you cry. Get a fresh start by decluttering your closet (or kitchen, or makeup or whatever). Get all Marie Kondo and ditch everything that doesn’t spark joy. Walk a dog. If you don’t have a dog borrow a friends pup or go to the animal shelter. Want to remember these tips? 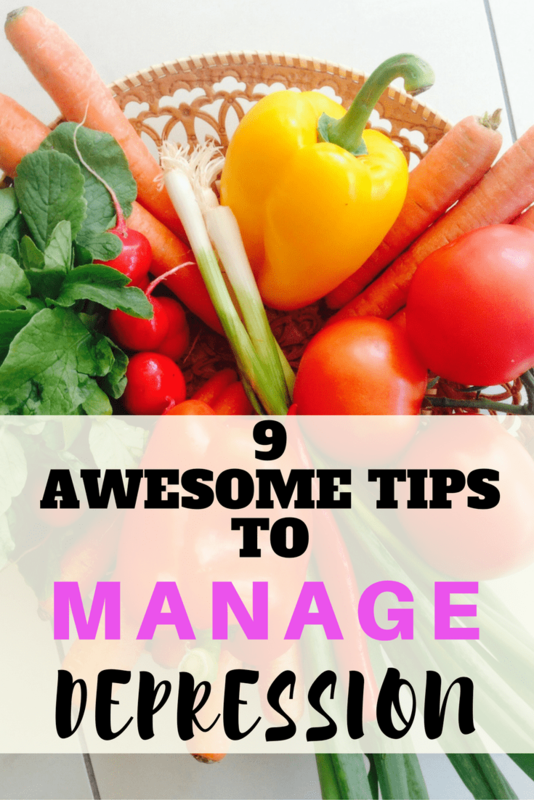 Pin this article to your favorite Pinterest board! All very good points! I struggle with depression and anxiety too. Sometimes it gets such a hold on me, I feel like I loose control of my abilities, to do even the most simple things (like taking a bath!). It makes it worse that I have 4 young kids to look after so I can’t “give in” and have to function at a level that their needs are being met (mostly on autopilot). 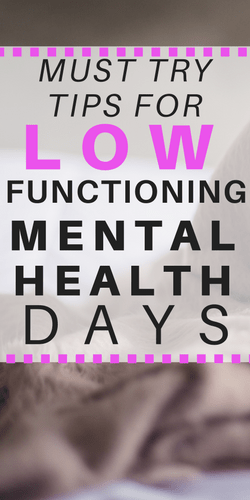 On those days… that is all I do (look after the kids and nothing else) which makes it harder to get myself feeling better because I fall into bed with none of my needs met. I’ve dealt with depression for a long time and if feels like I’m on a never ending roller coaster of ups and downs, would be great if I could get off of this ride! Lol do you have any advice of how to help myself claw my way out of the “black depression hole” with kids?? Thank you for you blog!